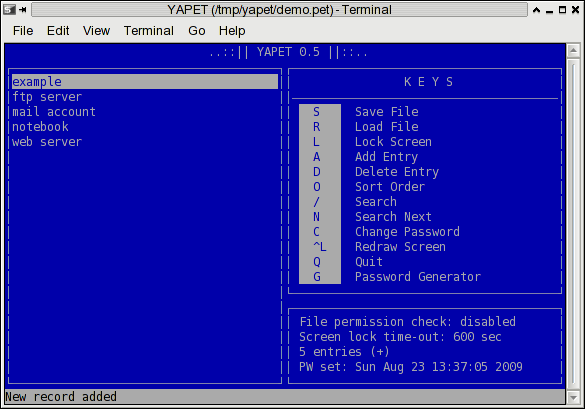 YAPET is a text based password manager using the Blowfish encryption algorithm. Because of its small footprint and very few library dependencies, it is suited for installing on desktop and server systems alike. The text based user interface allows to run YAPET easy and painlessly in a Secure Shell session. Great post and great software.. been looking for something like this. Was using CPM http://www.harry-b.de/dokuwiki/doku.php?id=harry:cpm (uses GPG) but this seems a lot easier to use and it’s also been updated recently (unlike CPM). Also, I noticed yapet is in the repo’s so a simple ‘sudo apt-get install yapet’ was needed. I needed something like this.